Jurors heard testimony from those who had close encounters with a killer Monday during the Gary Lee Sampson sentencing retrial. More than half a dozen people testified about their interactions with Sampson after he murdered 69-year-old Philip McCloskey in Marshfield on July 24, 2001, but before he killed 19-year-old Jonathan Rizzo in Abington three days later. From a young female store clerk who refused to give Sampson a ride, to a cab driver short-changed by Sampson, the witnesses had similar impressions of him – memorable, but not necessarily suspicious. It was the same impression a park ranger and environmental police officer had of Sampson when an employee of Myles Standish State Forest called them about him as the park was closing on July 27. "There's this fella down here and I need to close the park," the caller said, according to the testimony of former park ranger Cathleen Akin. "I don't know what to do, he's creeping me out." Ranger Akin and her then-future husband, Environmental Police Lt. Robert Akin, responded and eventually convinced Sampson – who claimed to be both retired military and employed by the CIA – to take a ride from the lieutenant to get him out of the park. "He seemed a little hesitant but he got in and sat down ... in the front seat," Lt. Akin testified. "He seemed very relaxed and happily participating in the conversation." It wasn't until the search for Rizzo intensified a few days later that Lt. Akin thought to say something about his dealings with Sampson at the park, testifying, "My interaction with Sampson was gnawing at my head." By that time, Sampson had surrendered to police in Vermont for the murders of McCloskey and Rizzo in Massachusetts and 58-year-old Robert Whitney in New Hampshire. Sampson's sentencing retrial continues Tuesday at 9 a.m. 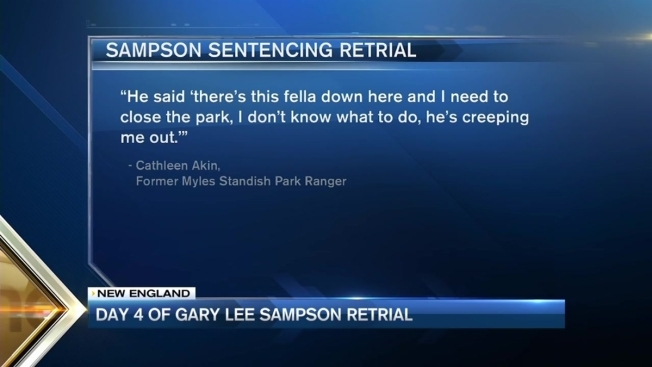 Continuing on the stand will be the Myles Standish employee who thought Sampson was "creepy" enough to call police.